Though in its day it was about to be eclipsed in the performance stakes, Triumph’s 1956 T100 reamins a great little motorcycle. Tiger 70, Tiger 80 and Tiger 90 models. When, under Turner’s leadership, the Meriden company produced the Tiger 100 a short time later, as the high performance version of his phenomenally successful Speed Twin, it was reputed to do 100mph. Would these figures stack up? Maybe, maybe not – all manufacturers of the day were quite capable of manipulating the truth and only one example of a machine had to achieve the magical model number/performance figure for it to be deemed acceptable. There are believable tales of journalists being invited along to test ride the new model, have a pleasant ride out in the morning as the new model copes well with town duty, displays a flexibility required for smooth riding and exhibits a thoroughly civilised demeanour. Suitably wined and dined in those pre-breathalyser days, the writer would return to where he had parked the machine to find it in exactly the same place with the head of the service department on hand to suggest the machine might want to be checked over to show how little oil it had used and how the tappets had stayed in their adjustment. This done, the writer would be sent off with the instruction to use the throttle a bit more so as the completely stock motor can breathe at the top end. As he heads out the factory gate the service manager nods to the marketing manager and he knows the hotter cams and followers are in place, as is the higher compression pistons and required jetting which will give the journalist a more spirited ride than his morning jaunt. A little too unbelievable you think? Enough examples of such practice exist for it to be not far from the truth. 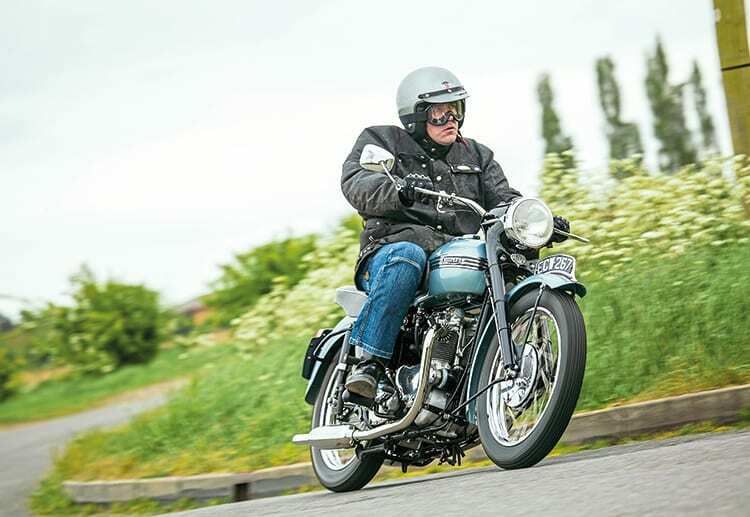 Getting back to the T100, there is no doubt the pre-Second World War version was a quick motorcycle and unlike highly tuned singles it had few foibles and was easy to ride. There was no reason why the post-Second World War version shouldn’t be the same. There were some modifications to the package of course, telescopic forks had arrived, there was a dalliance with a sprung hub viewed as a cheap way of putting suspension into a rigid frame (a whole two inches worth…) and Triumph had risked dipping a toe in the racing world with the Grand Prix. This short-lived 500 was much more than a super-tuned T100 but a genuine attempt to market an affordable racer even if some people did suggest it was a simple way of using up aluminium barrels and heads produced for a military generator set. However the word at Triumph was “we do not market race bikes…but we may produce a kit of high performance parts for those who wish to convert their own T100 to race specification.” This high performance kit was initially aimed at the rigid and sprung hub models but there were kits available for the swinging arm models and it is against this background interest was retained in the 500cc models. Not that Glenn Barker’s T100 pictured here has been a race bike. Glancing through Old Bike Mart one day, Glenn spotted an advert for a 1956 T100 for sale with the phrase which strikes terror into the hearts of all enthusiasts ‘stripped for restoration, but all there.’ Such adverts are not uncommon as the enormity of a restoration hits people and the bike lies forgotten in a shed or garage. As it was just up the road in Lancashire, Glenn decided he would go and see it and check it out very carefully. He did and surprisingly the T100 was all there and the restoration had been started with the wheels having been rebuilt by Steve Lomas at Five One Wheel Building in Lincolnshire. As we chatted, while Gary Chapman posed the T100 this way, then that way, I learnt Glenn had done all the black paintwork himself but entrusted the beautiful metallic blue – called Shell Blue Sheen – to his long time mate Ray Fish. The metallic colour is stunning once on but not easy to do properly and Ray is a seriously good painter. Not that Glenn was idle while all this was going on, the alloy polishing is all done by him on a simple mop arrangement and with lots of care and time the result is superb.